Life hurts all the time. 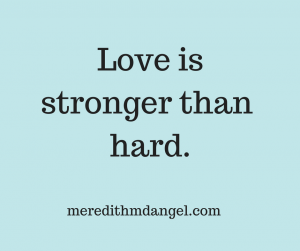 Life is hard, but love is stronger than hard. I choose to adopt a voice like the latter, not because it’s the easiest way but because it is the best way for me. The way that builds my character to make me more like Jesus. The way that leads to life and not destruction. This is not to say the writers voicing the pain every day are becoming less like Jesus. No, in fact, I believe they are making sacrifices each day that bring them closer than breath to Jesus. The other folks have their own purposes (or not) and I am in no position to judge. To look for the beauty and love is the way Jesus has called me to live, because he knows what is good for me. On my birthday, my dear cousin wrote to say she loved that I see the bright side in everything. She is right. I do. My smiles aren’t false; my joy is real. Unfortunately, so is the tendency to grow stormy when I’m alone, whether I’m navigating interstate traffic or sitting on my porch in the sun. It is with my intention and God’s grace that I fight the demons of the dark. My factory setting is melancholy. While I easily forgive others, I find it harder to forgive myself. (I am a Good Girl in perpetual recovery.) I see my flaws and failures; I feel worthless and unloved; I long for death and not life. This is my default. But we do not have to stay in our default settings. We have a hope and a realistic power to be more. It’s called Christ. It is neither my strength nor my gumption that makes me see the bright side. It’s Him. He fills me with warmth and gratitude. He lifts my head when I cannot and opens my eyes to life when I see death. The law of the Spirit, alive in Christ Jesus, sets me free. My life can be hard, but greater is He who is in me than the one who is in the world.